The second Test between South Africa and West Indies finished in a draw after no play was possible on the final day in Port Elizabeth because of rain. Having won the first Test by an innings and 220 runs, South Africa will take a 1-0 lead into the final match of the series in Cape Town on 2 January. South Africa, who were put into bat, made 417-8 declared, with centuries for Dean Elgar and Faf du Plessis. 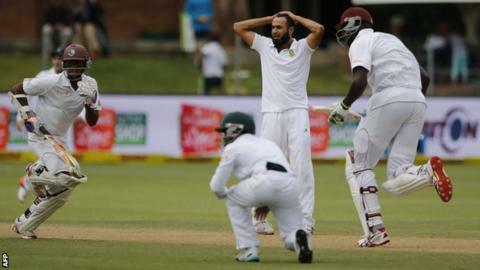 The Windies lost seven wickets for 44 runs on day four and closed on 275-9. Windies opener Kraigg Brathwaite, in his 16th Test, was named man of the match for his 106, a third Test century for the 22-year-old Barbados right-hander. The tourists have lost all three of their previous Test series in South Africa, winning only one of 14 matches.